Remember earlier this week when I said that my next post would be my finished Picnic Point quilt? Well, I *did* finish the quilt on Wednesday ~ yay! But then I realized it's way too big for me to take a picture of without my husband's help. So! We will have to snap those photos this weekend. Yesterday, I decided I just needed a bit of a sewing cleanse. No pattern, no plan, just tackle some scraps and sew them together. It was quite therapeutic. 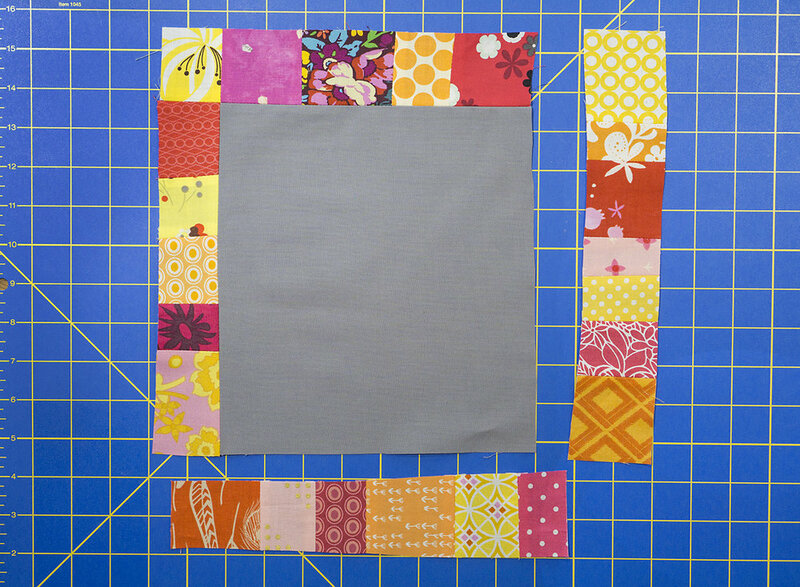 I ended up with these quilt improvy blocks that I decided to call Scrapbox Frames. I thought I would share my process in case anyone else wanted to make their own. My scrap baskets are a bit out of control. Then I used my rotary cutter without a ruler and freehand cut them into columns. I repeated this many times for lots of different scrappy strips. Next I guesstimated the size of a center square, cutting it a bit larger than I thought I needed. I picked a side and stitched the scrappy improv strip to the solid center. I worked my way around the center, trimming the gray and adding to the strips if needed. Voilà! Scrappy little quilt blocks! These are fun, they all turn out different sizes and are great scrap busters. You could nest one inside another. Lots of possibilities and a chance to sew without a pattern.